They then proceed to rattle off a long list of popular diets. The most frequently mentioned is Weight Watchers. The answer is fairly universal. The answer is again, fairly universal. This is what people do on Weight Watchers. Different foods are given different point values and those point values are meant to keep you from overeating. Essentially, it’s about portion control and restricting calories. But most people relapse. Now not everyone, I know. Some people do keep the weight off. But in my experience, these folks are few and far between. In my opinion the biggest reason why Weight Watchers fails more often than not is that it doesn’t teach people about real food. I could say this about any program that revolves around counting calories. Who do you know who eats foods like these everyday? 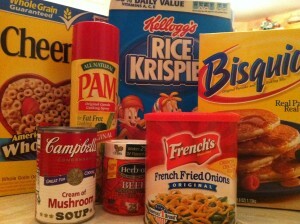 These are standard items in the kitchen cupboards of most Americans. These are not real foods. Forget the flashy health claims on the front. Take a look at the ingredients on the back. You’ll see the standard list of chemicals that are the realm of processed foods -sugar, hydrogenated oils, more sugar, soy byproducts, more sugar, MSG and of course, more sugar. These products don’t come directly from farms. They come from factories. Cheerios is a highly refined product that goes through an industrial process called extrusion which creates the flakes and in the case of Cheerios, the O-shapes. Extrusion uses high heats and pressure to do this. 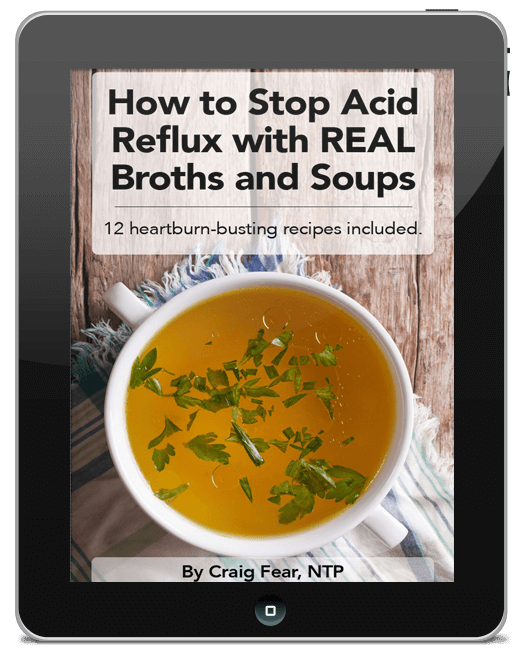 It damages all the nutrients and in the process creates potentially toxic proteins. Of course, the foods shown in the above pic are all fine on diets that count calories as long as they fit within a certain daily calorie limit. But remember, calories are a measurement of energy not nutrients. You can eat two thousand calories a day of nutrient rich foods or two thousand calories a day of nutrient deficient foods. The former will keep you satisfied and nourished. The latter will keep you hungry and malnourished. You can lose weight on both approaches. But the essence of good nutrition in not caloric content. It’s nutrient content. And this is my problem with Weight Watchers. Their list of sponsors are a who’s who of big names from the processed food industry – Eggbeaters, Tyson and Progresso to name a few. In fact, they’ve recently decided to partner with McDonald’s in Australia and New Zealand. And then there’s their own line of products full of processed ingredients. Yes, you can lose weight by eating less processed foods than more processed foods, but does this really promote long term health? When I work with clients both individually and in my group weight loss program I educate people about real food that promotes long term health. For example, there is a tremendous difference in the meat, milk and eggs of animals that are raised on pasture and those that is are raised in a factory farms. A good way to tell is to look at the color of an egg yolk. Color equates nutrient density. Pastured egg yolks will have a beautiful bright orange color. 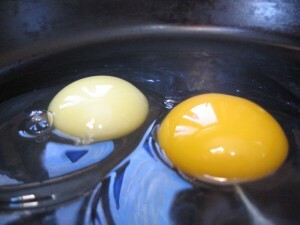 Non-pastured eggs will be more yellow. And in some cases (like with the photo I took above), they lack any color whatsoever. A similar example is wild salmon compared to farmed salmon. Wild salmon have a natural deep reddish hue. Farmed salmon have no color and are fed dyes to turn their flesh pink. Next time you’re in a seafood department, if both wild and farmed are on display, compare the difference in color. It’s shockingly obvious. There is also a tremendous difference between fruits and vegetables grown in nutrient rich soils and those grown in nutrient deficient soils. A good way to tell is to use your taste buds, especially with fruit. Ripeness is a good indicator of peak nutrient density. Most fruit in supermarkets is picked from large farms grown in nutrient deficient soils. It then sits on trucks and shelves for long periods and loses further nutrient value. This is why most fruit in supermarkets tastes horrible! I am always educating people about these differences. I also connect class members to local farms in my area, farms that are growing their food sustainably, farms that give back to the earth what they take, farms that care for their animals and allow them to roam and graze. I know not everyone is ready to fully embrace this and that’s OK. I give them options for healthier choices in their supermarkets and how to transition slowly to a more real food-based diet. Regardless, once people learn that it’s NOT how much you eat but WHAT you eat, they are shocked when they start losing weight without restricting calories.